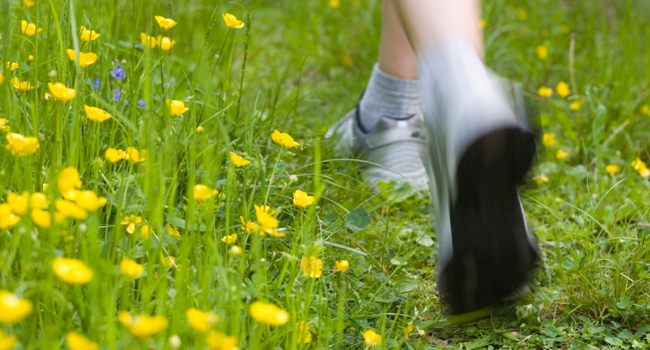 Don’t let hayfever ruin your running training! Hayfever has come early this year thanks to that unseasonably warm patch of weather. Great news for some, but not if you have hay fever. Here’s how to cope with hay fever and outdoor running. What exactly is hay fever? Hayfever is an allergic rhinitis caused when the immune system overreacts to pollen. The pollen allergen causes inflammation on the lining of the nose, and then the sinuses, throat, and eyes. If you’re a hay fever sufferer, you won’t need us to tell you all this! Hay fever can be caused by various types of pollen, including tree pollen, grass pollen, and weed pollens. About 25% of the UK suffer with hay fever, so you’re not alone. But that’s not much consolation when you’re trying to run with bunged up sinuses, itchy eyes, and incessant sneezing! Hay fever can impact your running. It can actually impair your breathing (by weakening nasal flow) and this affects your cardiovascular performance, concentration, and confidence. If you think you feel tired during bouts of hay fever, you’re right. All that extra work for your immune system means your energy is being diverted away from other physical and mental tasks. 1 Symptoms are made worse by pollen in the air – but also by high air pollution in towns and cities. Try to run away from central built up areas and main roads. 2 Also try to run in areas with less grass and other vegetation. This means avoiding parks, canal paths, or playing fields. If you’re lucky enough to be by the sea or a large river, this will be a good choice. 3 Wear sunglasses to reduce the amount of pollen which can get into your eyes. 4 Try running at different times of the day. Plants release their pollen in the morning and late afternoon, so avoid these times for running. Yes, this means before and after work! Can you run at lunchtime, or in the evening? 5 Sleep more than usual – sleep is really important for the immune system, and your body will need to fight off the attack of hay fever. 6 Pollen will stick to your running shoes, clothing and hair. Remember to not hang running kit outside on high pollen days (as you’ll just bring that pollen inside, and take it with you on your next run). Have a shower ASAP after a run to get rid of pollen on skin and hair. 7 Up your vitamin and mineral intake, either from a varied healthy diet or from a simple daily multivitamin. Vitamin A helps maintain the mucous membrane of the noise, Vitamin B5 helps reduce allergic symptoms, and zinc supports the immune system. 8 Eating local honey might relieve hay fever symptoms because it is made from local pollen. It’s worth a try! Can you avoid hay fever? Shutting your windows, taking a shower, and heading to the hills (or the coast) are the best ways to avoid hay fever. Over the counter treatments like barrier gels, antihistamines, nasal sprays, and eye drops could help you – but always ask the pharmacist for their advice.